The best places to retire in Florida make it easy to enjoy more personal time and spend it pursuing your favorite activities. If you’ve always wanted to live near water so that you could go boating or fishing whenever the mood strikes you or take in stunning views of the sunlight playing across an aquatic surface, Lake Griffin Harbor is the Florida community you’ve been looking for. Our gated waterfront community of high-quality manufactured homes is ideally situated in Leesburg, FL, not far from The Villages, one of the top retirement destinations in the nation. We take pride in making an active Florida lifestyle affordable for adults 55 and older who have always dreamed of spending their golden years on the water. For boaters, we offer a 55-slip marina, as well as a dry boat storage area and a boat launch. There’s also a fishing pier and, at our lakefront clubhouse, a spacious observation deck where residents can spend hours watching the wildlife or relaxing with friends in full view of beautiful Lake Griffin. The full slate of amenities we offer at Lake Griffin Harbor helps ensure that you’ll always have plenty to do with friends and neighbors inside our active adult community. However, when you’re in the mood for a sightseeing trip, you’ll enjoy an easy drive to one of Florida’s beautiful beaches, world-famous theme parks, intriguing historic sites, college and professional sports venues, and other nationally acclaimed attractions. 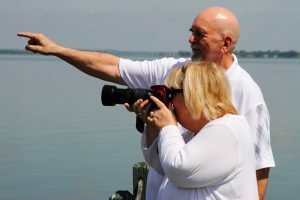 To see for yourself why Lake Griffin Harbor is one of the best places to retire in Florida, contact us today to schedule a tour. A member of our Lifestyle Team will be happy to set that up and also answer any questions you have about our beautiful, affordable waterfront community.